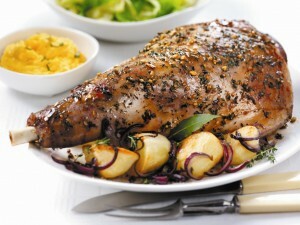 Eating lamb is intertwined with the traditions of Easter, an association going back to the earliest days of Christianity. A centuries old superstition held that lamb was lucky, as it was the one shape the devil could not take because of its religious symbolism. Whole roasted lamb has been the center of the Popeâ€™s Easter dinner for centuries, and many traditional Christian societies roast a whole lamb today. You donâ€™t need a whole lamb for your Easter meal though, and a leg of lamb has become the centerpiece of contemporary Easter dinners. It is easy to prepare, and delicious â€“ hereâ€™s a recipe that works well, we know that well as it has appeared on the pack of Pilotâ€™s famous EZ Carve leg for over 20 years! Combine all ingredients, and pour the mixture over the lamb. Marinate for 2 hours, or overnight in the refrigerator. Bake for 90 minutes at 350Â° F for rare, slightly longer for medium (we recommend using a meat thermometer). Allow to rest for 15 minutes before carving. Slice across the thickest part of the leg first, moving the knife gradually parallel to the center bone. Repeat on the other side. Serve, and enjoy! Happy Easter from your friends at Pilot Brands!